Exploring the headwaters of the Condamine River in Queensland’s south east provided us with a chance to test one of the latest SLRV caravan custom-builds, the SLRV Discoverer 2100. Driving within the purview of Mount Lindesay and the second highest peak in Queensland, Mount Barney, we travelled the back-roads through the McPherson Range, twisting along rugged mountain tracks, all the while looking for a gravelly creek crossing or steep muddy ascent that might cause the rig to falter. Settled by a babbling creek crossing, the custom-built Discoverer 2100 caravan had the look of a van set for adventure with a package that includes airbag suspension, galvanised chassis and body frame, matched with an electrical system that’d never run out, thanks to oodles of solar power with lithium battery storage and enough water for a long spell in the bush. First glance suggested it had the right stuff to turn a day outing into a longer self-sufficient adventure. Power-wise, the electrical package also includes a Mastervolt 100Ah charger and Combi Ultra 12/3000-150 inverter-charger. Although expensive, this unit is supposed to draw 30 per cent more power from solar panels than cheaper options. Considering the van boasts five REDARC solar panels providing a total of 750W of power, a gutsy charger-battery-inverter combo like this is worthwhile. Here’s the thing, timing meant we had to test this rig before it was completely finished. That meant no Anderson plug with which to charge the van as we wound through the mountains. That left topping up the batteries to the solar system alone. Nonetheless, even after four hours of running the air-conditioner and lights while in camp, we still had 90 per cent power. Getting out and about in the back blocks means knowing your van is as close to unbreakable as possible. Design strength is essential. SLRV tackles that issue like no other caravan manufacturer. While composite fibreglass panelling supported by an aluminium skeleton is common practice throughout the industry, SLRV goes a little further, substituting aluminium framing with steel, and so making the body frame continuous with the galvanised steel chassis. This brings some unique characteristics. Steel is typically stronger than aluminium but significantly heavier. That means you trade the lightweight frame for a very sturdy construction. 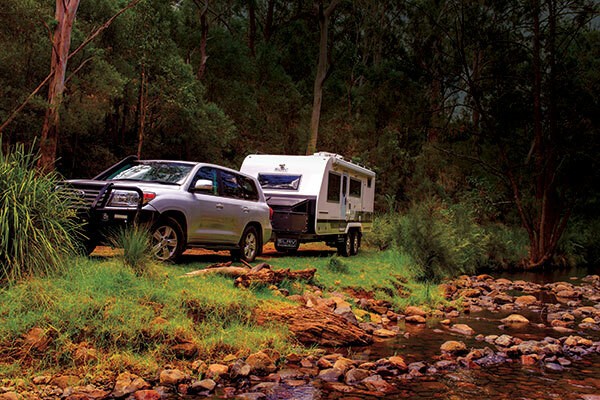 Consequently, you’re likely to need a bigger tow vehicle than the popular Toyota LandCruiser. Typically, something like a GMC Sierra Denali would do the job admirably with its 6.2L engine and a whopping tow capacity of over 5T. Nonetheless, without any extra payload, we easily hauled the Discoverer around the Main Range on the QLD/NSW border, through creeks, in and out of clouds, in sunshine and rain, with a LandCruiser. It’s likely that the SLRV van’s superb suspension coupled with its weight helped it hug the road, even around some quite greasy corners. Despite the numerous creek crossings over which these rough mountain roads ramble, none caused the airbag suspension any concern. Rightly so, given that airbag suspension is arguably the gold standard in offroad suspension. 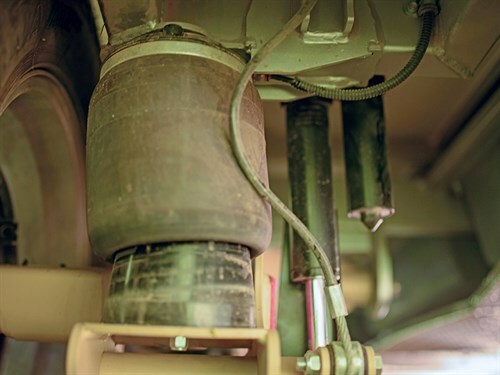 What’s more, when it came to rattling over the rough stuff, the Discoverer had plenty of protection from ample checkerplate underneath, protecting 6x 85L water tanks and a grey water tank. With over half a tonne of water on board when all are full, you’ll have more than enough water to last a long time. Although we didn’t need or use it, a Thirsty Boy creek and river pump in the kit further boosted this rig’s self-sufficiency credentials. However, the price of that level of self-sufficiency is more than financial. Weighing in at well over a half tonne of water alone, it’s potentially quite a burden on your tow vehicle. A small niggle whispered to me as we forded each creek crossing. I was aware that the drawbar tap, although set well back near the caravan body, is still relatively exposed to the risk of taking a thumping from rocks, boulders and goodness knows what as we crossed. It’s a small risk that a square of checkerplate mounted in front of the tap would easily mitigate. In camp, a handy drop-down table provides somewhere to rest a cardboard Chardy and sausage sandwich had I remembered either the sausages or Chardy. The latter, by the way, you’re able to prepare thanks to a handy slide-out barbecue that’s stored in the drawbar box opposite a gen set. Also, around the outside, you’ll find an exterior shower situated by a handy storage cupboard, at the rear of the van. The vertical storage box is a great use of an otherwise unusable void between the toilet and the rear wall. A ladder on the back wall beside twin spare tyres offers access to the roof to check or clean the solar panels. Move to the inside, and the first thing you notice is comfort aplenty on the interior, and so much storage you’re likely to never be left scratching about looking for a place to keep this or that. SLRV manufactures its own cabinets and applies the same emphasis on strength and durability to them as it does to the construction of the caravan. Well-made drawers and cupboards are spread throughout the interior, including an elongated cupboard space below the deep-set drawers in the place where you’d normally find a cabinet plinth kick-board. The floor level storage is a creative use of space. It might be useful for bits and bobs like a broom perhaps. If you added a lock you could potentially use it as gun storage — if hunting’s your thing. Also, at floor level, a second freezer is set under the dinette opening into the entrance way. This might be handy for the extra meat or the fish you’re inevitably going to catch. Overhead lockers, divided compartments under the bed and a sturdy and generous slide-out pantry, also add to the significant amount of storage. While the pantry takes care of tinned and dry foods, a 195L fridge/freezer in the kitchen is a worthwhile size. Deep drawers, a four-burner cooktop and oven, together with a kitchen tap for potable and non-potable water and plenty of useful bench space, will likely please the travelling gourmet aficionado. Beyond the kitchen, the en suite also has plenty of storage including a useful waterproof cupboard in the shower in which you can stock your soap and shampoo. Within an en suite cupboard, a useful front-loading washing machine is ready to help keep the Y-fronts fresh. Entertainment-wise, a flat-screen TV with satellite reception, together with Fusion Marine entertainment system including an iPod dock, keeps things rocking. Plenty of USB charging points around the caravan mean your music will always be playing. At bedtime, you're sleeping on a queen-sized bed in air-conditioned comfort surrounded again by an embarrassment of storage including in-floor, bedside, under-bed and overhead lockers. And if the nights get cold, a diesel heater will keep you warm. 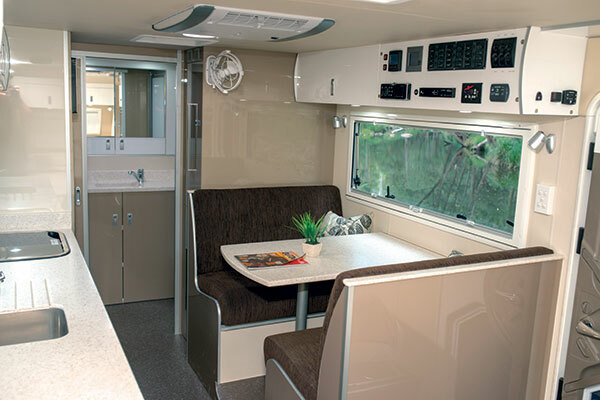 In the Discoverer, SLRV has made an intelligently-designed, strong and well-constructed caravan. Although its steel construction makes it heavy, it is a rig whose dry weight won’t change as it has all the features anyone seeking to stay off-grid somewhere, would want. This isn’t a van that you won’t have to add extra weight by adding extra gas or solar. An SLRV Discoverer caravan is a worthy consideration if you’re looking for luxury adventure. The full feature appeared in Caravan World #574. Subscribe today for the latest caravan reviews and news every month!